I have just updated all my edge to edge catalog's and posted them on the website. I was thrilled to find an easy way to print the catalog's again. This is one of my most time consuming task, I normally add a few new patterns each month and it has been hard to keep the catalog's updated. I have listed my website in google maps however it shows up as a sewing company. It seems that even after all these years Long arm quilter's simply have no category. Now I get asked all the time if I will make a quilt for hire. I am sorry but I no longer have time to do that for other people. It is that choose your Niche thing again and there just is not enough time in the day. I do have a person that I can send you to if you are interested in having a T-Shirt quilt made and I do send work to her all the time in that area. The main focus of my business is quilting the quilt tops that you have made. I just love doing it and have been doing this since 1999. I am now up to 3 computerized machines. One Nolting and 2 Gammills. Most of the quilting I do is Edge to Edge. My general rule is that I scale the designs with no more that 2-3 inches left un-quilted. I like scales that look realistic, so if that flower would be 2-3 inches in life that is what I want to see it on the quilt. I can go smaller and/or larger if you like, just make sure you tell me each and every time because as much as I would like to say I will remember, I will not remember who likes what each time. I am still trying to shift my website searches back here to this site so again please be patient and just know I am still here, still working and still loving life. Oh My, I feel as if I have come home again. I have missed the friendliness and interaction with this website provider. I simply feel more connected to my customers here. If you had not noticed and do not know what I am talking about - about 6 months ago I changed to another provider and thought I really wanted to have an on-line shop. Well I was quickly reminded that you really do have to pick your niche in this world and mine is quilting. I leave the product sales to the quilt shops, that is there niche. I am glad to be home again here at Ebiz website and so very grateful that all my info was maintained during my absence. I plan to close my other website just as soon as I can but if you want some great deals in the store part of it you can visit it at. www.thequilterstation.com - notice that sight only has on S in the name but I am the same person, It may be a bit confusing until I get it all wrapped up. I really am the same person on both sites. Thanks so much for your patience and please feel free to send along as many quilts as you like and as often as you like. Quilting is my passion. After taking a break from custom quilting service for about 2 years I have found that I miss the process. I have also found that very few quilters are doing custom work anymore. I just purchased a 3rd quilting machine that I am going to dedicate towards freehand custom quilting. I have spent the last 2 months refreshing my skills with my own quilts and am now ready to open the service to my Customers. I do still ask that you also send me your edge to edge quilting jobs as well. Custom work takes a good deal more time and skill and as much as I love the process it is really the edge to edge that feeds me and I really apprecate my loyal customers. I am offering an introductory price as low as 0.055 cents a square inch for basic, 0.065 cents a square inch for simple. Both basic and simple are completely free motion with little stitch in the ditch work. 0.095 Cents a square Inch for more involved quilting using rulers, marking etc. I also have the ability to move the quilt to one of the computerized machines to pop in computerized designs as I see needed. I spent over 10 years doing free motion quilting and won many awards as well did many of my customers. I do love the artistic freedom of the process and look forward to creating a one of a kind quilt for you. I Love feathers! Check out this great site for all your embroidery and multi decoration needs. 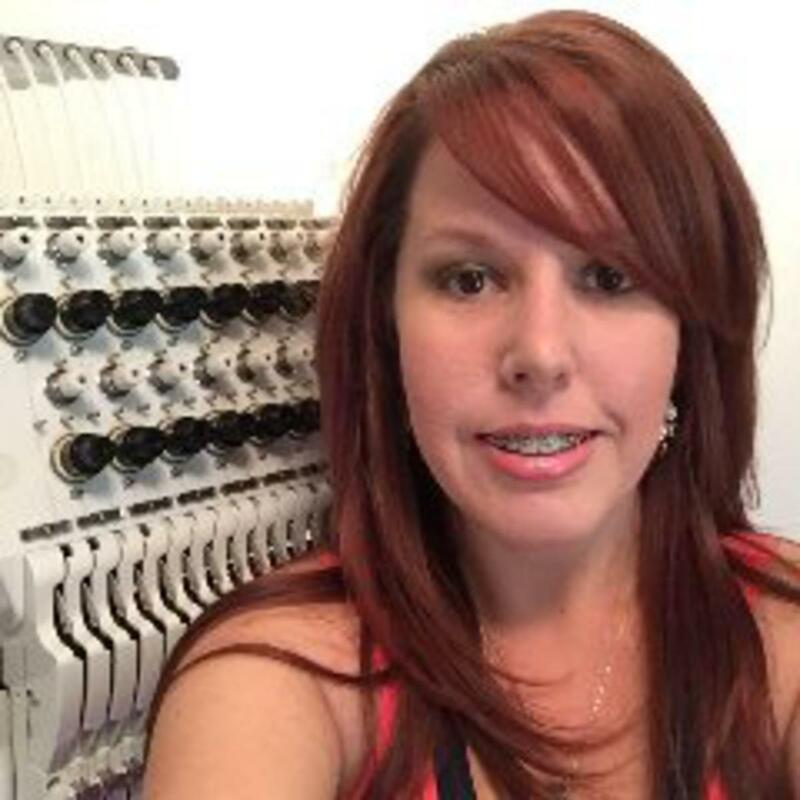 Lisa has been building her business and skills for 5 years now from a small home machine to 2 commercial embroidery machines and a commercial set up for vinyl and rhinestone decorations. No job is too small or large. She totally amazes me in her talent and keen eye for design and color. From Monograms to High End Bedding. Jacket backs, logos and so much more. She has no fear and is willing to tackle complicated jobs most will shy away from. Check her out at http://flutterbyembroidery.com/ She is also on facebook posting her latest creations: http://facebook.com/flutterbyembroideryandmultidecoration/?fref=ts. 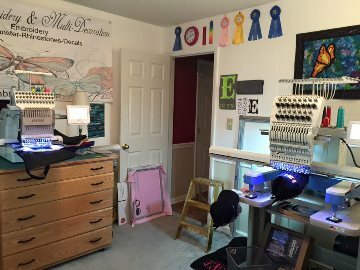 Lisa aka Flutterby Embroidery is my Daughter and her studio is in the same location as mine her in Harrisburg, NC. Funny story about us. Lisa is actually my Daughter in-law. She was married to my only child Jason Lee Verrier and had 2 beautiful children together. I first met Lisa when she was 17 years old. After my Son Jason died in a motor cycle accident on Aug 17, 2008 Lisa and I became even closer, she finally began calling me Mom and I have to tell you as strange as it sounded at the time it was so very nice to still have someone call me MOM. I have watched Lisa blossom in so many ways over the years, On that fateful day we both lost someone we loved with all our hearts. At the same time Lisa lost her job as her office was closed, she had enrolled in college and now suddenly she was a single Mom of 2 young children. With a lot of hard work and determination Lisa finished college at the Belmont Abbey with her 4 year degree in Liberal Arts with Minors in Psychology and Sociology. Lisa also became very active with Hospice in the Grief area of children. Both of my beautiful grandkids now 13 and 14 years old are happy well adjusted children as their Daddy would want them to be ( I know he is so proud of them and of Lisa). A year before my son Jason passed, Lisa also lost her Father to a sudden heart attack, she had not one really to turn to who understood and this experience told her she needed to make sure the children had all the help they needed. I could not be prouder of her for all that she did and I know many many times she would have liked to have given up and yet she pushed on. After graduating from college, Lisa realized the kids still really needed her home with them. The kids were very active at school and doing so well. Lisa continued her volunteer work with Hospice taking care of people in the last phases of life. She then also started helping me in my studio with quilting. I bought her a small used home sewing machine with an embroidery unit. Well 5 years later you see what she has done with it. Lisa now lives just a few minutes away from me, works from my home to give her a place to go when the kids are in school and she has re-married to a wonderful man we are grateful that the kids can call DAD. I now have a Daughter, We mostly do not tell this story because we really have become Mom and Daughter but sometimes it is good to know the story behind the person. I hope you will check out her website and facebook and keep her in mind when you have that next project. Lisa's Studio for Embroidery. She also has another room for the Multi Decorations. If you have been following me on Facebook you may have seen some of my post regarding my weight loss. I started this wonderful program Feb 2, 2016. I was fed up and not feeling very good about myself and I was starting to have some health issues. I saw a post from my cousin in Mich saying she had lost 35 lbs in just about 5 months. I had to know what she was doing. I have tried just about every diet written but I never had long lasting results. I have a busy hetic lifestyle with running my own quilting business and my husband loves to eat out. I don't have a lot of time to exerise and it is hard to stay on a plan. After talking with my Cousin and learning about Isagenix, I did my homework searching about the product and reading up on the information she sent to me and called her the next day to sign me UP! Within the first 3 days I of using the program I was convinced this was a workable lifestyle for me. Today I have released 18.1 pounds and over 21 inches. Although I still have a long way to go I am still excited about this program and find it very, very easy to stay with. Even with company coming and going out to dinner often I am still loosing weight. Better yet, I have tons on energy to work my long late hours. I am sleeping wonderful (A first for me in over 8 years) and I am building lean muscle so no flab that you often get when loosing weight. Lets face it the older we get the harder it is for us. My mental clarity is much better and Cholestrol is dropping without drugs. I do enjoy walks and will sometimes jog a little, but the best thing is this is 80% nutrition and 20% excercise. No need to spend hours in the gym working out. However if you enjoy the workouts this is also a great plan. My daughter is now joined the progmam and her performance as a runner has been improved greatly. I typically do not care to share what I am doing but I am so impressed with this program that I am excited to share it with anyone and everyone who is ready to make a life change to improve health. This is much more than a diet, it is truly a wonderful health program that happens to have weight loss as a side effect. If weight loss is not wanted they have you covered for that as well. If you are ready to take the plung and try the program for 9 days or 30 days visit my website at http://rebeccaverrierwatt.isagenix.com/ http://rebeccaverrierwatt.isagenix.com/ for more information. What have you got to loose and I promise you have everything to gain. I am looking forward to sharing this journey with you. I am very excited that both my grandchildren 14 and 13 year old Alyssa and Damien were choosen to go on a 10 day European trip with their school in the summer of 2017. They will be doing many fund raising events to help pay for this over the next 15 months and the best one of all is the donation page set up by the tour company. The children get 100% of all funds donated to the page which is much better than selling candy door to door and most of the other events where the kids only received 10-20 % of funds raised. This is such a wonderful optuneity for their education. If you would like to help see them on their way with this wonderful edventure of Germany, Switzerland and Italy we and they would greatly appricate any and all help they can get. Their Mom and I will also be going with them so as you can imagine the cost is very high and we are focusing on raising funds only for them. I have a link to each childs page if you would like to help. Thanks again so much and really any amount adds up fast. Once again I have been working around the clock with Bedding market. This has been a hard season but I have mananged to stay up to date and continue to take in customer quilts and meeting those deadlines. I do so love working on customer quilts and very much look forward to having more of my focus on you rather than Big company. So please do not ever feel as if I am too busy for you because I am not. Quilting is my passion , what I love and will continue to enjoy. Give me a call anytime and I will be happy to set up an appointment for you. I also plan to start dipping my toes back into custom quilting very soon. This will only be available to those customers who have been with me over the past 2 years or more with edge to edge quilting. If you want to become a regular customer of edge to edge you can start now. Custom quilting will be discussed on a one on one basis. I just love those days when I run into someone and they tell me, Oh I thought you were not doing quilting anymore. Well I am here to say that is nothing more than a rumor. I am doing quilting just as much as I always have. Please feel free to give me a call, I would be happy to do the quilting for you. I did have a few weeks last March that I was not able to do any rush jobs - those that must be done in 2 weeks or less but that was short lived and we are (have been) back in full swing since.